The province is building on recent moves to protect Albertans and the environment while ensuring a fairer liability system for oil and gas companies operating in Alberta. 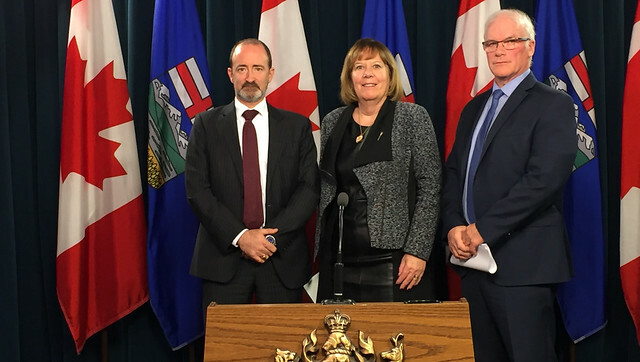 L-R: Brad Herald, vice-president, Canadian Association of Petroleum Producers, Margaret McCuaig-Boyd, Minister of Energy, Jim Ellis, president and CEO, Alberta Energy Regulator. The government worked with the Alberta Energy Regulator (AER) on amending a key requirement, known as Directive 67, to close a loophole. Officials from companies that walk away from wells or other oil and gas infrastructure without cleaning up will now be subject to greater scrutiny and AER discretion if they apply to start new companies. Changes made to Directive 67 will support companies that behave responsibly and help shield them from potential further increases in the number of orphan wells, which are reclaimed through a fund which industry pays into under the polluter-pays principle. Marty Proctor, president and CEO, Seven Generations Energy Ltd.
A $235-million loan to the Orphan Well Association (OWA) to accelerate the cleanup of old wells across the province over the next three years. Launching a broader review of oil and gas liabilities to determine long-term, made-in-Alberta solutions. Lobbying the federal government for changes to bankruptcy laws that would hold companies accountable for their environmental cleanup. Supporting municipalities provincewide with a credit for uncollectable taxes on disowned oil and gas properties. This most recent action stems from the 2016 Redwater decision by the Alberta Court of Appeal and other receivership cases that have been undermining the AER’s ability to ensure companies and operators are held accountable for their actions. This case is currently being appealed to the Supreme Court of Canada by the AER. Many other receivership cases within Alberta have used the precedent from the Redwater decision in disclaiming assets, raising Alberta’s orphan well inventory dramatically. The OWA’s inventory increased to 1,861 wells that were in need of reclamation in November of this year, up from 705 wells in March 2015.